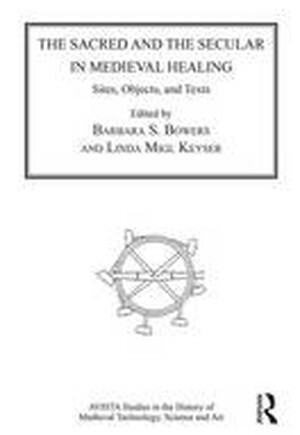 This volume challenges and redefines the traditional distinction made between the sacred and the secular in medieval healing, medical practice, and theory as evidenced in the historic, text record, and by material culture (sites and objects). The studies here are interdisciplinary and are grouped into two parts. The first focuses on secular and religious texts, demonstrating how the language of sacred and secular healing blurs and merges in both Latin and vernacular textual traditions. Chapters critically examine how medieval English literature draws directly from medical discourse when representing the physical and moral consequences of wrath; the reasons why empirical experience in medical education is central to the writings of Valesco de Tarenta; the narrative significance of Bede's representation of plague in his eighth-century prose Life of Cuthbert; and the implications of distinctions between late medieval religious sermons and secular discourse on plague. Authors also discuss how secular medicine and religious faith intersect in two, recorded, late medieval English miracles and present the largely unexplored impact of access to food on people's everyday health. The second part investigates how the concepts of the sacred and the secular are seen in material culture. Chapters explore how the practice of lapidary medicine by early practitioners and midwives used the protective and healing properties ascribed to gemstone amulets, eagle-stones, and lodestones. At pilgrimage sites, the dynamic nature of cure and spiritual interaction is evidenced in art and artifact. One type of object, pilgrim badges from English sites, is used to explore statistically the wider social context of faith and healing. Preface / Introduction: The mandatory matters of sickness and healing in the Middle Ages, Jones / Part I Secular and Religious Texts: Sacred and secular wrath in medieval English sources, Langum / Writing about medicine per viam experimenti: Valesco de Taranta (fl. 1382-1426) and the presentation of empirical medical knowledge in the later Middle Ages, York / Plague in Bede's prose Life of Cuthbert, Ziegler / Doctors and preachers against the plague: attitudes toward disease in late medieval plague tracts and plague sermons, Gecser / Describing death and resurrection: medicine and the humors in two late medieval miracles, Craig / Getting enough to eat: famine as a neglected medieval health issue, McCleery / Part II Sacred and Secular Objects and Sites: Early medieval crystal amulets: secular instruments of protection and healing, Kornbluth / Loadstones are a girl's best friend: lapidary cures, midwives, and manuals of popular healing in medieval and early modern England, Harris / Performative thaumaturgy: the state of research on curative and spiritual interaction at medieval pilgrimage shrines, Bugslag / Life (and after-life) insurance in the medieval period: insights offered by the distribution of pilgrim badges recorded by the Portable Antiquities Scheme in England; Geoff Egan, in memoriam., Lewis / Index.